Kleio G. Apostolaki was born and raised in Athens, and is originated from Chania. She studied Psychology with Clinical Psychology at the University of Kent in UK and continued her post-graduated studies in Mental Health (MSc.) at King’s College of University of London where she specialized in Dynamic and Cognitive Behavioral Psychotherapy. In Greece, she completed studies in STAPP (Short-Term Anxiety Provoking Psychotherapy), by Dr. Petros Sifneos of the Harvard Medical School, while she trained in family counseling, childhood and adolescent mental health, learning difficulties and psychometric tools. In 2009 she received her Diploma in Ecopsychology from the University of Strathclyde in Glasgow. 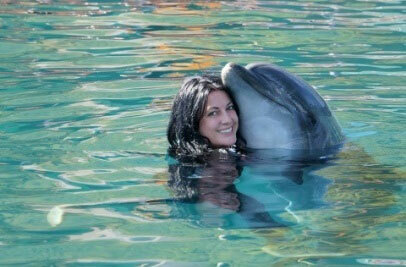 She also studied Dolphin Therapy for children and adults with psychological, neurological and motor problems at the Dolphinswim Institute in cooperation with Sigmund Freud University in Vienna and is an official partner and therapist in Greece of the Alpha Therapie Academy based in Austria and Turkey. She has worked in the Adult Psychiatry Department at Guy’s Hospital in London, and since 2002 she has been working as a freelancer in Greece. She has taken part in numerous international and national conferences as a lecturer, she writes in the journal and daily newspapers and she has a large number of TV broadcasters as a guest expert. She is a member and President of the International Society of Ecopsychology (IES) and officially recognized as the representative of IES in Greece with the establishment of the “Hellenic Ecopsychology Society”, which has been active in Greece since 2007.